I bought this book for my wife. 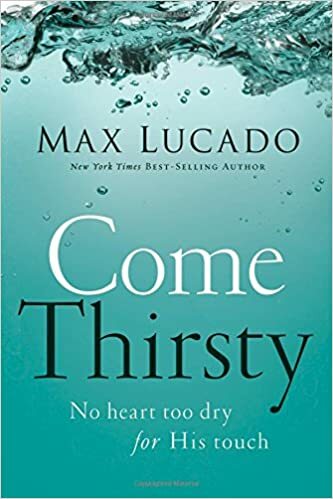 We went through a phase where we could not read enough Max Lucado. It was a good phase. Max Lucado is an excellent teacher. I try to read Lucado's Grip of Grace once a year, though I have (admittedly) not been able to do so for the past few years. It will probably be on my short list for my next read. An audiobook is great for a long, pleasure run. An audiobook is terrible for a run which pace is important. Max Lucado's calling card is Grace. It is his number one topic. Don't read Lucado for a treatise on anything other than God's marvelous, infinite, matchless grace. Yes, he touches on other subjects. But his forte is the grace of God. Come Thirsty is yet another angle on that theme. If you are parched by this desert of a world, drink deep from the wellspring of God's Grace. This is a strong 3.5-star book which is often overlooked in the canon of Lucado's writings. No, it's not an essential read like several of His other books, but you will not be sorry you spent some time on this one. I heartily recommend it.